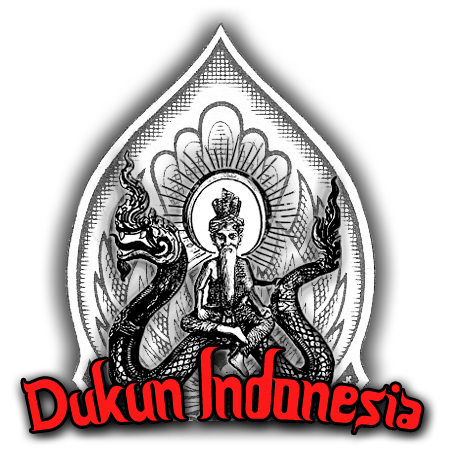 The legend of Highly Developed Beings has been told in different Mythologies and Cultures around the world. In Thailand there are also various legends of “Pu Wised”, or Lersi , Arahants or Yogis. These Lersi are said to have possessed various powers, such as Knowledge of Herbal medicines, minerals, magical invocations, and supernatural abilities such as Levitation, Teleportation, Alchemy, and Mind Reading. Most traditional Lersi respect the Pantheon of Higher Beings according to the Brahmin tradition. Namely; Lord Brahma Shiva and Vishnu. Most Lersi practice the development of power and evocation/invocation(Peng Kasin). The word ‘Peng’ means in principle to “stare”, but in this case it really means to insert or transform matter or substance whether it be physical element or spiritual element. Bpatawee Kasin (Pali – Paṭhavī), for example means to project earth element into a target/object. Bpatawee means Earth. Apo Kasin means to stare/project water (āpa means water element) – one technique used for example to master the evocation of water element would be to obtain clear water, such as rain water for example, and fill a clean container with it (not to the brim). After this meditate and stare ate the water until the inner experience of absorption with water occurs. once mastered the use of this mind evocation in conjunction with the Kata “Aapo Kasinang” will enable the master to evoke water element into another element , such as earth. This is in fact the technique used for Kong Grapan and Maha Ud, which is the effect of making a bullet harmless or a gun refuse to go off when the trigger is pulled.The solid (earth element object is turned into a soft watery element, and thus becomes harmless. In another fashion, also the hardness, impenetrability and density of stone/earth can be used to project into softer objects to increase Kong Grapan resistance. Dtecho Kasin is the Fire Elemental, and Vayo Kasin is the Air Elemental. Is Por Gae a Buddhist? 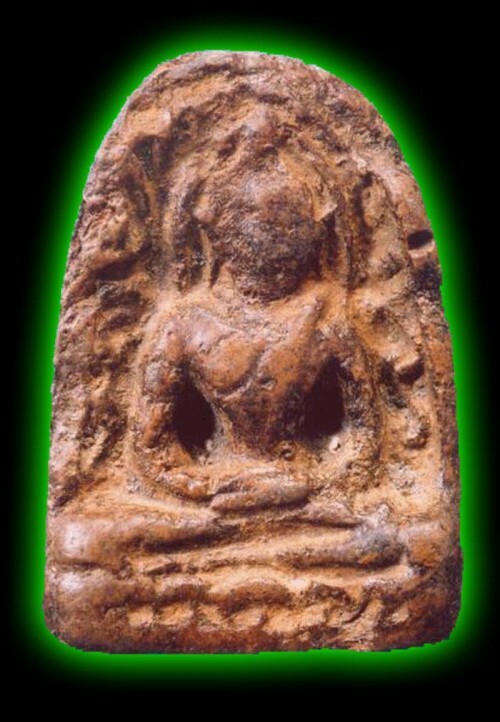 Because of the evidence pointing to the Lersi Por Gae Ta Fai having played an important role in the creation of the “Pra Sum Gor Amulet, it is evident that Por Gae respected the Buddhist faith. He can be supposed to have been an extremely important figure in the land because the Pra Sum Gor statue and amulets were made in what is believed to have been a rather large Ceremony, probably a Royal Ceremony because the filigraine detail of the statue and amulets indicate a major event. Por Gae is also known as Lersi Isworn (Ishvara), because it is considered that Lersi Ta Fai is an incarnation of the Divinity Shiva/Isworn – the Third Eye is a symbol thereof. Por Gae Lersi Tai Fai appears in numerous legends and Myths as well as historical documents. For example in the history of the Birth of the Province of Petchaburn, there is a famous story that tells that the King/Ruler of Petchaburn in that time had learned Sorcery with Por Gae. But after he received the teachings and knowledge, he planned to kill Por Gae Lersi Ta Fai. As a result Por Gae cast a Great Curse on the Province of Petchaburn, and a Terrible Plague fell upon them, leaving the whole Province almost Void of Living Inhabitants. This amulet is from Wat Ta Gradan (on of the three main temples in Kanjanaburi province on the banks of the river Kwai. The facial traits of many examples of Pra Ta Gradan are also very similar to the facial aspects of Lersi Hermits, and the wound topknot displays obvious signs that the image represents a Lersi Image, not a Monk. 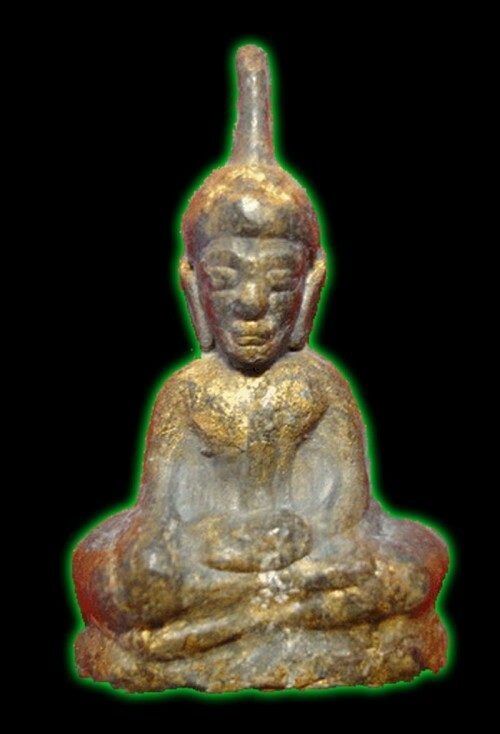 The Pra Gru Tham Suea amulet is most obviously made in the image of a Lersi, noticeable by the raised topknot. Apart from this, the Hermit Por Gae Ta Fai is also reputed to have had a part in the creation of the Pra Sum Gor Amulet; The legend tells that when this amulet was in the making, there were four different Lersi presiding over it’s creation, Namely; Pra Lersi Pilaalay Pra Lersi Ta Fai, Pra Lersi Narod, and Pra Lersi Gaiyagote. This Amulet is counted as one of the five “Pra Benjapakee” amulets which are reputed to have an age of not less than one thousand years. 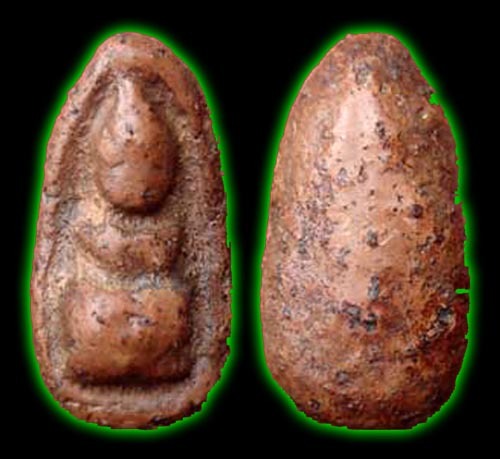 Because of the documented evidence appearing in various historical recordings related to the creation of these amulets, and the fact that all of the aforementioned amulets date back to more that one thousand years ago, it can be assumed that Por Gae Lersi Ta Fai really existed, and that he lived at least one thousand years ago, if not more than that. Because of the ability of the Lersi to live for hundreds of years, it cannot be known how far back his appearances go… Many Thais recount that Por Gae was around 2000 Years ago, meaning that this Lersi Hermit may have been able to extend his lifespan for up to one thousand years, if the accounts relating to the creation of the aforementioned amulets are true. This extreme extension of lifespan is also accredited to the great alchemist St. Germaine, who in principle learned the very same methods of elemental transformation and evocation as the Lersi. In principle the Lersi were also alchemists, because of their ability to transform one element into another. The Relationship between Por Gae Lersi Ta Fai and the Shiva Deity. The name Por Gae is a rather mysterious thing, due to the fact that his presence has been mentioned in various times over the past thousand years or more. Lersi Por Gae’s legend is sometimes seen to be related to Luang Phu Taep Loke Udorn, who is another mysterious character who results in being extremely difficult to trace his existence.Their legends have many factors in common; one of these factors is the ability to cause fire to arise from a simple glance, due to having achieved Samabhati (Chaan Samaabat in Thai), and having practiced Kasin Fai (the control of the element of fire). The images/statues created in likeness of Pra LersiPor Gae Ta Fai can be seen to have three eyes, the third in the center of the forehead. 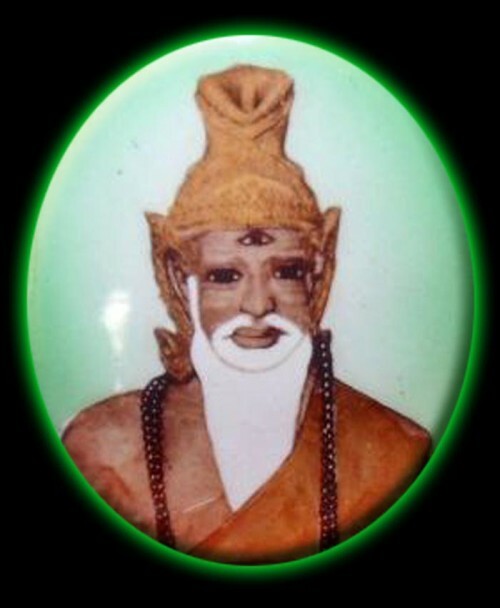 According to the legend, whenever Lersi Por Gae would open the third eye, flames would arise in the line of sight of his third eye.According to both Brahmin and Buddhist beliefs, the possession of a third eye is the result of having practiced self control and renunciation over a period of many thousands of lifetimes. Such a meritorious person is recognized at birth by observing various signs that can be found on the body of the person; One of these signs is the form of an Unalome in the center of the forehead (Unalome means a spiral shape). The Unalome is seen as a sign of the third eye, or Divine Eye. 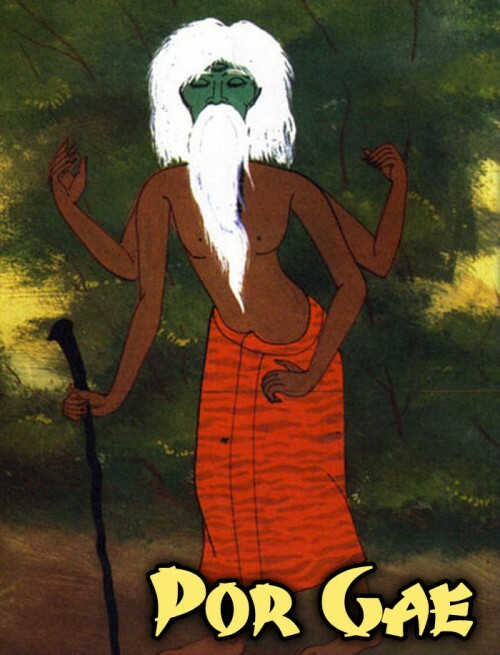 It is believed that Lersi Por Gae Ta Fai is also the Avatar (earthly incarnation) of the lord of the world (Shiva, or Ishvara – in Thai known as Pra Isworn or Pra Siwa). Lord Shiva is one of the three lords of Heaven in Brahmin cosmology, and is considered to be the highest of the three due to the fact that he has never fully incarnated as a human being, only sending parts of himself as messengers, teachers or agents of his doing.Lord Shiva, or “Pra Isworn” if you like, is believed to have a third eye in the center of his forehead. This Third Eye is synonymous with the third eye of Por Gae. An additional factor that is synonymous with Siva (or Shiva) and Por Gae is the fact that whenever Shiva opened his third eye, whatever was in the path of his eye, would be consumed in flame. For this reason Thai people believe that Pra Lersi Ta Fai is a manifestation of an aspect of Pra Isworn (Shiva). 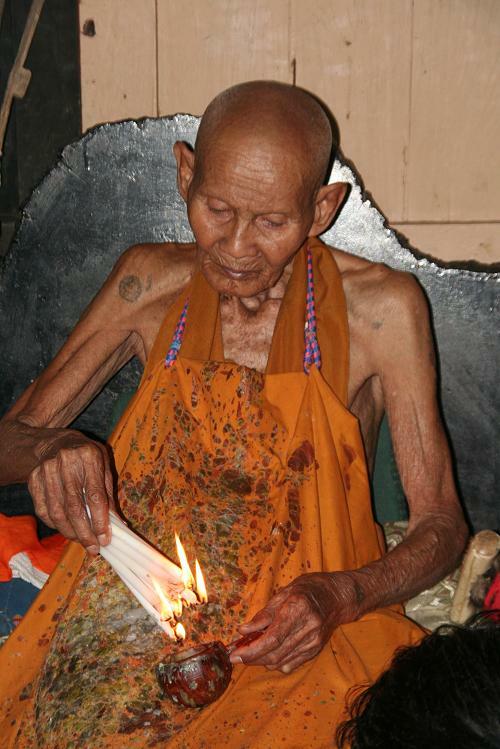 Thai people believe that Pra Isworn manifests as Lersi Ta Fai in order to be a teacher for the sake of Humankind. Shiva is the supreme Lersi of all Lersi. Shiva or Siva is the Hindu God of Destruction and Change. Shiva is part of the Hindu Trinity along with Vishnu “The preserver” and Brahma “The Creator”. Shiva destroys the world which Brahma then in turn creates and then the cycle repeats (Gruenwald). Shiva not only represents change as destruction, but also positive change; for example, breaking out of bad habits. Shiva is also seen as representing Truth, Beauty and the most essential Goodness. Shiva has had two wives, Shakti and Parvati; He is also the father of two other Hindu Gods, Ganesha and Kartikeya. Shiva lives atop Mount Kailasa in the Himalayas (Narasimhachary) . Shiva is said to have sprung from the head of Brahma in the form of Rudra and separated into male and female in order to show the mercy of God. He has the potential to bring great destruction, while on the other hand but he can be kind and forgiving (Bowes). Shiva is a god who exhibits many facets of his personality, some of which are pleasant and some that are not so pleasant (Sherrat). Shiva has five major forms and five major energies. These five forms are all depicted in sixth five-headed form of Shiva known as Panchavaktra. (Gruenwald). Other names and manifestations are: Bhairava, Daksinamurti, Mahesa, Nataraja, Nrtyanatha, Rudra, Sadasiva, Yogi, Linga (Michaels). Did Por Gae really exist? the following legend of the City of Sri Taep in Petchaburn reveals that perhaps he did. In the City of Sri Taep in Petchaburn there is an ancient legend referring to Por Gae Lersi Ta Fai; The legend tells that the Ruler of Sri Taep was a devoted disciple of Por Gae Lersi Ta Fai, and that he studied magical powers and meditation with Por Gae until Por Gae Lersi had placed complete respect and faith in the loyalty of his student. 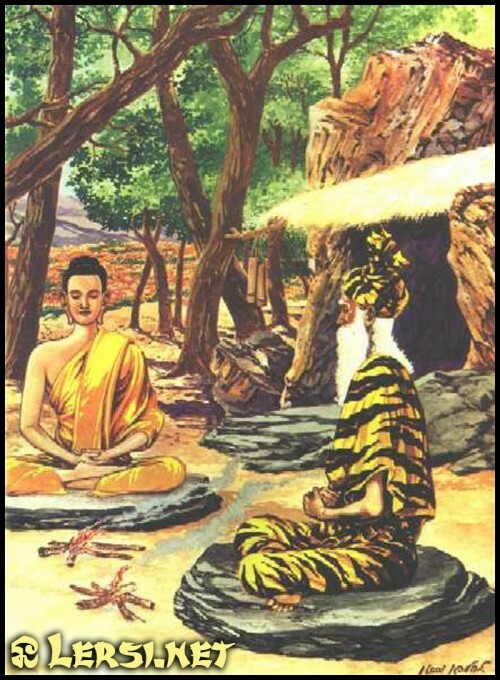 There came one day where Por Gae invited his student the Ruler of Sri Taep to accompany him to the depths of the cave where Lersi Por Gae Ta Fai practiced his meditative powers and develop Jhanas. Inside this cave there were two hidden wells. These wells were of a magical nature; If a person would immerse himself in the first well, he would be consumed by the well and die, leaving only a skeleton to prove the person had ever been. The second well had the miraculous quality of turning things to gold – if a person immersed himself he would be suddenly turned to gold. But the second well also had the second quality of being able to reanimate a person who had died in the first well. Taking the skeleton and immersing it in the second well would revive the person to the world of the living. Once agreed on this, Por Gae proceeded to jump into the first well – the inquisitive Lersi was consumed in a flash, leaving nothing remaining except his scorched skeleton. His apprentice however, instead of acting according to Por Gae’s request, upon seeing that Por Gae was no more, the greatly loved and trusted student unfaithfully gathered his belongings and fled from the cave, because he thought that once his master was gone, he would be the most powerful entity in the region, and that no one should be able to bring harm on him now. He should never need to fear anyone ever again after this. After a long time had passed, the Lersi Ta Wua (cow eyes Lersi), who was an intimate friend and colleague of Lersi Por Gae Ta Fai, began wondering what on earth could have happened to his friend Por Gae, as he had heard absolutely nothing from him for an extremely long time. He had never disappeared for such a long time till now, so Ta Wua thought that something must be wrong somehow. So Lersi Tha Wua used supernatural powers to hover in the air, and flew to the cave of Por Gae Lersi Ta Fai to see what was wrong. Once he got there, he journeyed deep into the depths of the cave until he discovered the skeletal remains of Por Gae in the divine well of acid. Lersi Tha Wua understood immediately what had happened and dragged Por Gae’s skeleton out of the well and took it to the second well of revival and immersed his remains in the well. Such tales that are to be found in Thai history and mythology seem to indicate not just that Por Gae Lersi Ta Fai really existed, but also that he wasn’t just a local village magician, but a great wizard with extremely strong spells and powers. 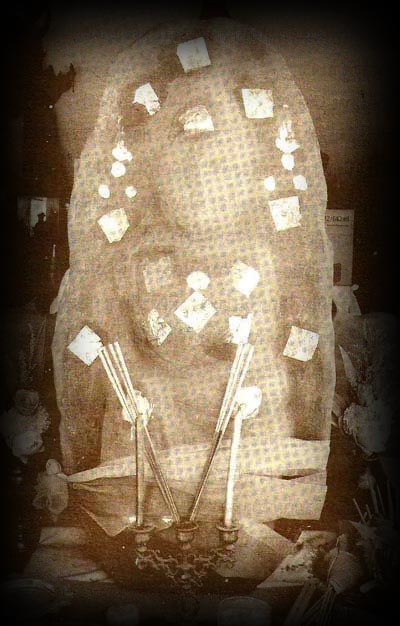 Por Gae Lersi Ta Fai has been revered by ancient people and is still revered by modern Thai people in both the Buddhist and Brahmin religions. Admittedly, Por Gae is more evident in the Brahmin tradition, but considering that Thai Buddhism is strongly influenced and oriented towards the Brahmin faith, it is also evident that the Lersi in Thailand were/are devoted to the Buddha as well as the Brahmin pantheon of divinities (Shiva Vishnu and Brahma).The Lersi have evidently practiced elemental powers and control of the aforesaid elemental powers, as well as mind control, meditation and developing their consciousness. The only thing remaining that they did not do was become ordained as Monks of the Buddhist Sangha, but still fulfilled all the requisites of ordination, and a lot more too. The Lersi were called to be present and take part in nearly all important Buddhist ceremonies of history. It is therefore considered that the Lersi are to be revered and considered a great blessing to pay respects to, and is considered to be a connecting with the lineage of our ancient forefathers and teachers of old. Prana Yama and Breath Mindfulness as Healing Energy. Bowes, P. (1977). The Hindu Religious Tradition. Boston. Michaels, Axel. Hinduism Past and Present. New Jersey: Oxford University Press, 1998. Narasimhachary, M. (1997). Handbook of Hindu Gods, Goddesses and Saints. Delhi, Sundeep Prakashan. Sherrat, B.W. (1972). Gods and Men: A Survey of World Religions. Glasgow.